Many people seem to have a trouble learning how to draw a nose. It is probably because noses project out from the face, whereas the mouth and eyes are more level with it. 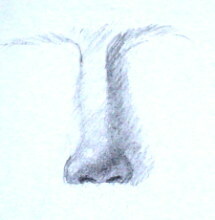 The easiest way to draw a nose is just to draw 2 dots for nostrils or a flying bird-shaped line. However, this doesn't show the construction of the nose, and the result is not realistic. If you want to learn how to draw a nose realistically, you need to understand the underlying anatomy. This will enable you to express your subject's individuality and character. The nose begins where it meets the forehead and brow—in an inverted wedge shape—between the eyes and at the level of the eyebrows. Narrowing at the bridge, the nose widens as it travels down the face toward the bulbous tip above the upper lip. The area below it recedes. 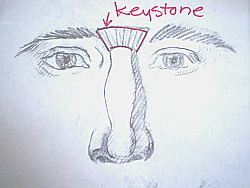 The area where the nose meets the forehead and brows is shaped like a keystone (see the drawing on top). Watch out for this area, as it's one that many beginners overlook. There is a delicate shadow here and a light spot just under it where the bridge of the nose is indented—the spot where eyeglasses rest when they are worn. 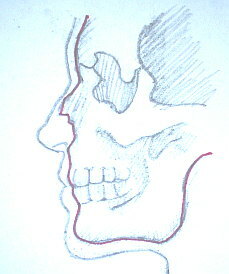 The drawing below shows that, beneath the skin and muscle, the nasal bone extends downward from the forehead bone of the skull about 1/3 of the length of the nose, and ends at the nasal cavity. Most of the structure of the nose is made of cartilage. When there is a bump on the nose, it is usually at the point where the bony structure ends. 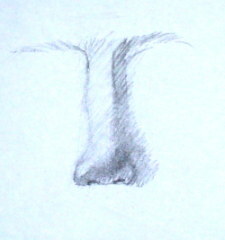 This area is one of the most important in terms of capturing each individual nose's personality. So, when drawing noses, break your highlights here. Alright, now I am going to break down the steps of how to draw a nose by from the frontal view. You can use yourself as a model (by looking in a mirror) or you can copy a picture of a face. For the first time, if you can, it is best to draw from life. Now let's begin to learn how to draw a nose. Start at the top of the keystone and draw two lines indicating the sides of the keystone. 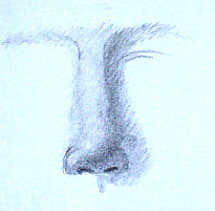 Next, mark the deep indentations on either side of the bridge of the nose—near the inner corners of the eyes. Then make a mark at the base of the nose. It helps if you lightly indicate the outer bounds first, since you can't just begin at one end and hope that all will come out right at the finish. Lightly draw the triangular shape of the nose as shown in the middle left drawing. 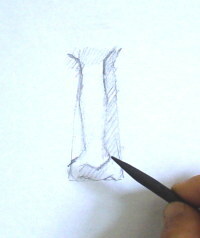 Thinking of the nose form as a solid block, draw the side plane on the shadow side, the side plane on the lighter side, and the top plane. 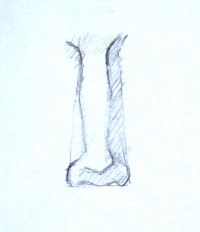 It is important to begin drawing noses this way, even if you do not see all of the planes. Now draw the fleshy rounded ball of the nose. Use rounded lines to express its more bulbous shape. 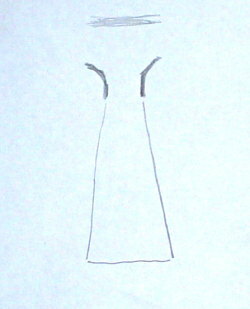 Then draw the flaring wing-like shapes on either side. Now indicate the bottom plane (the underside of the solid triangular block). Draw a light line where you think the side plane of the wing forms turn under to become the bottom plane, and also where you see the top and front of the ball of the nose curve to become the underside. Now you have a basic frontal nose drawing! Don't forget the shadow cast by the nose on the cheek, or the area between the nose and the upper lip. Make the shadow light, otherwise it will look like a black hole. To make the nose project, you can make the shadows on theside plane and the under plane of the nose darker than the shadow on the side plane of the face, going back toward the ear. If the nose looks too noticeable, deemphasize it by using light or middle values for the shadows. Keep lines soft to subdue the shadows cast by the nose. Remember to clean up the drawing by removing the construction lines. Touch it up by rounding off forms where necessary. Bring out the highlights at the bridge of the nose—just below the keystone shadow—or on the bony part of the nose. Playing down the highlight on the tip of the nose is always the best policy. Make sure that your subject is well lit. If you have to use a photograph, avoid those with head on lighting. You will encounter noses seen from different perspectives and angles. If you remember how the nose is constructed, it will make it less of a challenge when you have to deal with foreshortening and perspective. 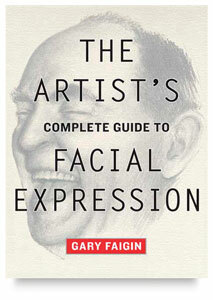 Highly recommended - Learn to draw a nose in various facial expressions with Gary Faigin.